Last night I took the time to wander and wonder outside our North Lake home with my camera taking pictures of the super moon. The evening not only was beautiful but the act of having to focus and refocus my camera helped develop in me thoughts about the importance of focus and refocus in my life. Reflection and refocusing in one’s life for me is not only good but imperative. I’m sitting at my desk for the moment between the time of administering two exams. How best should I use this “free” time? Too often I use the time to start yet another project. Instead this time I am reflecting. I also am trying to dictate this blog piece using my Nuance Dragon Professional software. It surely has improved in terms of its accuracy and ease of use, and it is far past time for me to learn how to use it to my advantage. Still, it has its limitations (or perhaps I still need to learn better its features). “Hours longer we to bury was.” That gibberish was what the software produced when I attempted to quote something I read in Latin almost 50 years ago: “ars longa, vita brevis.” Art is long; life is short. So much to learn; so little time. So much beauty to discover and to appreciate. So many perilous experimentations to be risked in order to live more fully. So many difficult judgments to make. So many difficult conversations needed. Yet, I continue to believe that I have been blessed by being given the opportunity to teach and to learn continuously. Summer time in theory allows me time to embrace the 5 R’s: Reading, Reflection, Regrouping, Refocusing, and Rejuvenation. Alas, it’s past time to revisit the 270 applications on my Macbook Pro and decide which are essential, which are duplicative, and which should be removed to free up space. 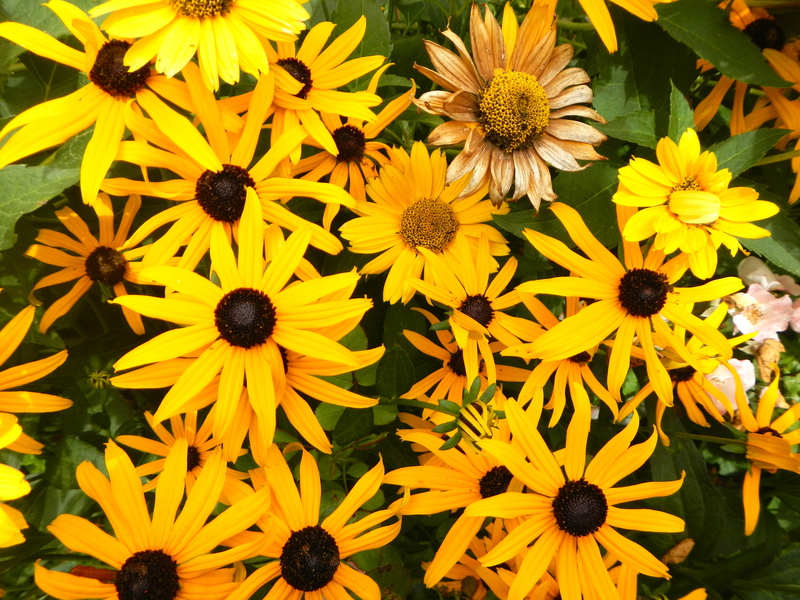 Still, I want to leave some remaining summer time for enjoying the simple beauty of the flowers. There are many drawbacks to having too many applications (and electronic devices). One challenge is keeping them updated, though I subscribe to a number of services which alert me to updates and upgrades. Another, is simply keeping track of them in terms of what they do and how well they do the task. A third challenge, is keeping in mind to what degree they are portable and comparable in capabilities across the electronic devices which I use. And, then, of course the electronic devices themselves “evolve” with new operating systems and new devices. Tonight I am focused on apps on my Macbook Pro which begin with the letters A-C (or begin with a number). 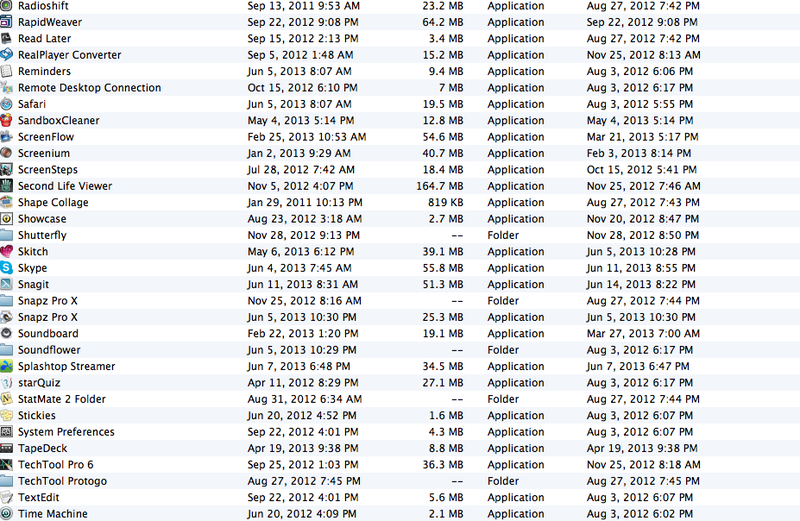 Clearly my most valued applications are 1Password and Camtasia. I continue to delude myself into thinking I can find some teaching potential for Clarify, Comic Life, and Crazytalk. Hey, a guy has to have play time. Influenced by technology learning tool visionaries such as Jane Hart and Michele Pacansky-Brock and by practitioners such as Susan Manning and Kevin Johnson, Steve Johnson, and Irma Milevičiūtė I have been focusing my attention this year on the viability of a new course that would incorporate such learning tools. How, though, does one decide which to use among the plethora of tools available and among the increasing number appearing? In my search to answer this question I initially drew upon three primary resources. Susan Manning and Kevin E. Johnson, in their valuable book The Technology Toolbelt for Teaching, suggest that among the things entering into one’s decision should be thinking through 1) what problems would be solved by using the tool, 2) the cost of the tool, 3) the “platform” which will be used, 4) the level of expertise needed for the user, 5) issues of accessibility for special needs students, 6) technical requirements, and 7) the reliability of the tool. Steve Johnson’s Digital Tools for Teaching provided me a useful starting point for examining 30 e-tools (grouped according to appropriateness for the novice, the developing user, or the advanced user) for creating, collaborating, and publishing. Michelle Pacansky-Brock, in her superb book Best Practices for Teaching with Emerging Technologies organizes her recommended “toolkit” in terms of those which are essential, those which enhance or facilitate communication and content creation, and those tools useful for back-channeling and developing participatory learning. For the past six years I have been intermittently exploring the Top 100 Learning Tools championed by Jane Hart. At the end of last year I experienced a fortuitous opportunity to focus on the usefulness of the tools. On April 26, 2012, a call for proposals was made university-wide to use technology to develop course materials and travel plans for Carroll Cross-cultural Experiences (CCE’s). On April 27, my six-member student-research team composed of Phoumany Phouybanhdyt, Ryan Waters, Catrina Duncan, Amy Peterson, Elizabeth Firkus, and Maxine Venturelli emailed me that they enthusiastically and unanimously wanted to rise to the challenge of creating such a course. In October of this year they were successful in being awarded the opportunity. 1) Twitter: I have become much more Twitter-literate having a good sense of whom I want to follow. 2) Wikispaces: Served as a first sandbox repository for collaboration for my student research team. 3) Ning: Though it is expensive, the return on my investment is having a controlled, (for now) FaceBook-like private environment which allows seamlessintegration of chat, videos, blogging, and other tools. 4) Google Docs: A place and means where my students can share with each other the results of their research efforts. They actually taught me its utility! 5) WordPress: My preferred platform for blogging (after evaluating six). I have been able to reach out via FaceBook and Linked-In WordPress connections to alumni, present and former students, new International friends, and trustees who shared an interest in our project. 6) Skype: One of several Voice Communication tools we have experimented with. 7) Ipad Apps: A plethora which I shall explore more fully in another post. Since each of my students was awarded an Ipad for this project, we have concentrated especially on making sure the tools we use have a “mobile” technology application. 8) Various Browsers: Safari, Chrome, and Firefox in particular. It was enlightening and frustrating to discover that not all apps or tools are equally friendly across all browsers. This was especially the case with Screen-casting software. 9) Epals and Edmodo: Though I ultimately found both too restrictive for my uses for this particular project, through them I became much more aware of the exciting and extensive uses of these tools by K-12 students—and I formed an especially enriched international friendship. 10. Diigo (especially for educators): I am daily informed of resources which have proven to be invaluable for this project. Later this week my students will share a preliminary report of their research and I’ll learn which tools they found of most value for course creation and course participation. In the near future I’ll post the 10 learning tools I definitely am going to invest considerable time into this summer if this project continues or if I am encouraged to continue my efforts. Embarrassed by my failure to vote in local Wisconsin elections yesterday, I am pondering my vote for Jane Hart’s annual Top 100 Learning Tools. This semester I have made the time to examine each of the tools listed, committed myself to extensively investigating the usefulness to me of ten of them, and encouraged my student research students to incorporate those they found most useful into their Pioneering a Virtual European Cultural Experience Project. Concomitantly I continue to search for the right balance between life on the net and disconnecting through making time for off-line reading, reflecting, relating (interesting typo: “realating” as opposed to “virtual” relating) , and writing. I must that confess my writing while NOT using a computer has become a rarity. At the top of my short-list of reading this summer are The Googlization of Everything:And Why We Should Worry), To Save Everything, Click Here: The Folly of Technological Solutionism, and Alone Together: Why We Expect More from Technology and Less from Each Other. How do I go about defining my “top 10 learning tools”? One answer is to identify which of the tools I use most often. Put another way, which tools have become so part of my academic life that I don’t notice their importance to me unless they are inaccessible? These would clearly be 1) Twitter (which I have finally discovered how to tame and put to use), 2) WordPress (to which I have converted), 3) Skype (about which I have much yet to learn), 4) Facebook (which I may soon abandon), 5) Diigo —through which fellow educators—especially K-12—continue to teach me), 6) Microsoft Word, 7) Ted (which amazes and inspires me—but which also often mesmerizes rather than encourage interaction), 8) my Ipads (and my increasingly expanding library of apps with unknown half-life), 9) Google Chrome (though I migrate across five or 6 different browsers depending upon the browser default of the computer I am using) , and 10) Survey Monkey. Which learning tools are most likely soon to join the category of essential (and “invisible) to m ? My guess is that some of them be identified through the experiences of my students and others as I complete three research projects this semester (answering Jane Hart’s Top 10 challenge, completing my instructional/mentoring role of the Virtual Cultural Immersion Project and completion of my review of all the apps I’ve accumulated on my Mac and IPads). I’ll address each of these issues soon in subsequent posts. Still pondering; always learning. Your comments and feedback are most welcomed.